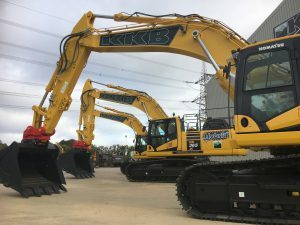 Home / Machinery / KKB Group purchase Komatsu hybrid excavators for recycling sites. 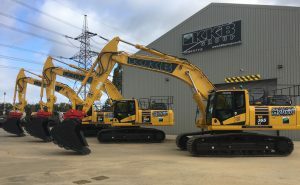 KKB Group purchase Komatsu hybrid excavators for recycling sites. Based in Rochester, Kent, and supported by satellite sites providing nationwide coverage, KKB Group are specialists in providing niche services to the construction, remediation and recycling sectors. One of the businesses long term ambitions is to continuously increase the value and environmental performance of the regeneration and built environment process for its clients. Given this focus it is perhaps not surprising that the company has invested in the innovative Komatsu HB365LC-3 hybrid excavator. The first three of these Stage IV compliant machines have recently arrived with KKB Group and gone straight out to work. “We have vast experience of operating large recycling contracts for blue chip clients. Not only do we pride ourselves on providing high quality recycling solutions and products, we want to be as efficient as possible during the process.”Colin Basi, CEO of KKB Group explained. “To that end it is vital for us to maintain a relentless level of investment in the latest plant and technology and that is why we have chosen the HB365LC-3 as our hybrid excavator of choice. The three we have recently taken delivery of have gone straight out onto our recycling site operations where they are loading crusher screeners with Asphalt to produce a clean range of recycled aggregate product (RAP)”. KKB Group work hard to invest in products that will enable their customers to meet both their environmental and productivity objectives. KKB Group work with many companies like Hanson, Tarmac and Aggregate Industries, and the company provides a complete solution of machines and operators. 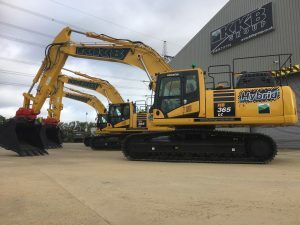 These large customers have come to expect a proactive approach from KKB Group who opted to trial Komatsu Hybrid technology with the purchase of four HB365LC-3 two-years ago. 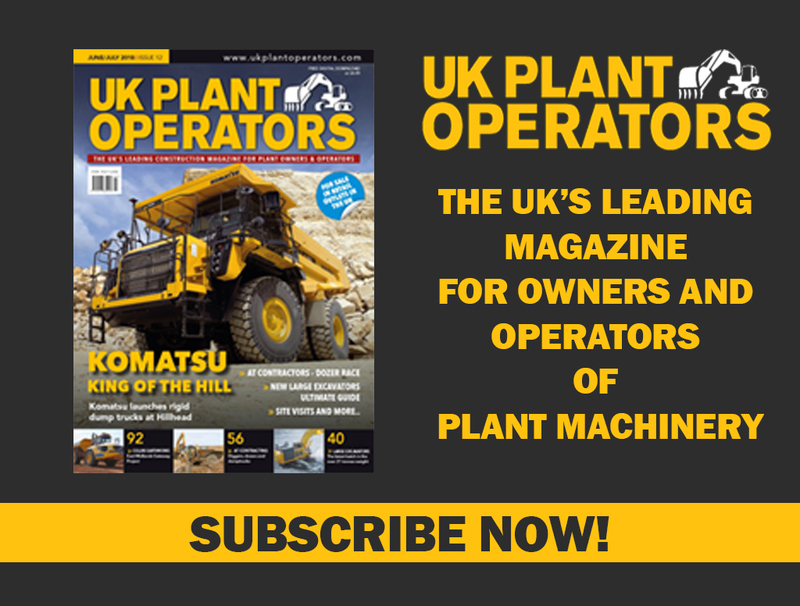 Dion Palk, Marubeni-Komatsu’s Area Sales Manager for the South East, said, “We have a long-standing relationship with Colin and the team at KKB Group. 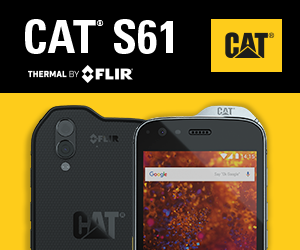 They recognise the importance of optimising their return in quality investment, whilst putting the needs of their customer’s first, by providing the optimum in efficiencies with no compromise to quality, performance or production. It was obvious to KKB Group that the innovative technology of the Komatsu HB365LC-3 was their natural choice. It is clear that KKB Group are focused on helping customers to reduce their carbon footprint and increase efficiency but the number of safety features on the new HB365LC-3 are of great importance for KKB Group and its customers. “Doing our job as safely as possible is vital, we have had fantastic feedback from our operators on the machine’s all-round camera system, KomVision which provides operators with a real-time bird’s-eye view of the machine via four networked high definition cameras. Aside from this we see real benefits from the neutral detection system for travel and work equipment levers, helping to keep everyone onsite safe.”said Colin. After two decades, KKB Group are still applying the most innovative techniques and technologies to maximise the value of waste material. As the construction industry looks for ways to reduce its carbon output and increase sustainability the need for suppliers who are willing to invest in technology also increases. For this reason, Marubeni-Komatsu and KKB Group look set to continue a strong partnership driven by a collective green ambition.